Reminder: Metro will host two live, interactive telephone town hall meetings from 6:30 p.m. to 7:30 p.m. on Wednesday April 4 and Thursday, April 5, to talk about Metro’s NextGen Bus Study and outreach for Metro’s 2018-19 budget (the new fiscal year begins July 1). The timeline for the bus restructuring effort. Click to see larger. reflective of and attractive to the residents of L.A. County. The meetings will be simulcast in English and Spanish. 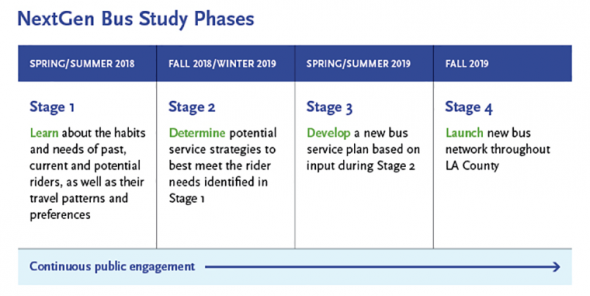 Metro officials will also be holding “listening sessions” at each of the agency’s Service Council meetings this month with the public invited to provide feedback on their experiences with the Metro bus system. For the Telephone Town Halls, residents across Los Angeles County will be called at random through an innovative automated telephone system and invited to participate in the public forum from the comfort of their own homes. The Telephone Town Hall also will include an option for participants to provide input through real-time polls. When residents answer their phones, they will be automatically be connected to the meetings. Anyone who does not receive a call but wants to participate can dial into the toll-free telephone number listed below. At least Foothill Transit line number system matches that of LA Metro, but Santa Monica and Long Beach have different systems with duplicate line numbers. Another reason for reincarnating a new SCRTD as the Southern California Regional Transportation Authority covering Los Angeles, Orange, Riverside, San Bernardino, and Ventura Counties. Service frequency needs to improve across the board and is perhaps the biggest issue IMO. Bus lanes and signal priority are another, but that’s a whole other endeavor. Nobody wants to wait 45 minutes for a bus on a major street just because its the weekend/off peak hours or they’re connecting to or from another key service like the orange line bus. For example, on Ventura blvd. local buses run at 20 minute intervals at best outside of rush hours and that’s only for east of reseda blvd. The 150 and 240 lines split there and continue north on reseda and west on ventura respectively at less than 40 minute intervals. Frequency on these routes should be doubled or more. Also, metro rapid service should run 7 days a week (like it used to) and run later.